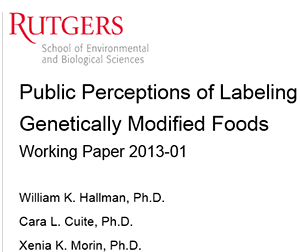 This working paper (see link below) contains findings from an October 2013 online U.S. national survey on public perceptions of labeling of genetically modified (GM) foods. Labeling of GM food and food ingredients is an issue that has been garnering national attention as a result of a 2012 ballot initiative in California (Proposition 37) and an upcoming 2013 initiative in Washington State (Initiative 522), as well as legislative actions in at least 20 other states that would require labeling of GM foods. Proponents and opponents of GM labeling have spent tens of millions of dollars in the last two years attempting to influence public opinion. The question is whether Americans are paying attention.